Jerusalem — January 13, 2015 … The bodies of French terror victims Yoav Hattab, 21, Yohan Cohen, 20, Philippe Braham, 40, and Francois-Michel Saada, 64, arrived in Israel aboard a pre-dawn flight from France. A few of these men wanted to make Aliya to Israel, to move to Israel – but not in this manner. Thousands of Israelis, including Israel Prime Minister Netanyahu, Israel President Reuven Rivlin, Cabinet and Knesset members gathered at the Har Hamenuchot cemetery in the Givat Shaul section of the Jerusalem. President Reuven Rivlin was the first to speak. “This was pure, venomous evil, which stirs the very worst of memories,” said Rivlin. “This is sheer hatred of Jews, abhorrent, dark and premeditated, which seeks to strike, wherever there is Jewish life,” Rivlin said. Rivlin called on European leaders to act to put a stop to such acts of anti-Semitic violence. 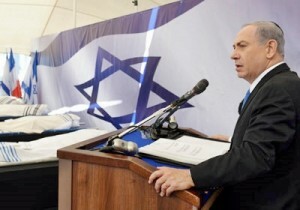 Netanyahu then addressed the grieving Jewish mass, most of whom had tears flowing down their cheeks. Netanyahu concluded: “Today more than ever, Israel is our true home, and the more numerous we are, and the more united we are in our country, the stronger we are in our one and only state – and that is the hope of the entire Jewish nation.